Buying your first Classic Car can be an exciting, fun adventure. BUT…If you don’t know what to look for, and look out for, your “cherry” ride can quickly become a “lemon.” Here are 10 critical points to consider before starting, and during, your Classic Car purchase. 1. Stay In Your Budget For Your Classic Car Purchase! Establish a budget your paycheck can live with. Classic car restoration shop rates are high, and, if you buy a fixer-upper, can force you to quickly exceed your budget on outside labor. It makes poor financial sense to spend more on your Classic Car restoration than the vehicle is worth. Consider how you want to use the vehicle. There may be no need to find a “show condition” vehicle if it’s going to be your everyday car. For classic car competitions, be sure to buy something with “all original parts,” and a “show car” should be in pristine condition inside and out. Carefully consider what year, model and body style you really want to own. If you know the model you are interested in, narrow it down to a few specific years of the model’s production. Generally, convertibles are more desirable than hard tops. 2. Due Diligence…Do Your Homework! Keep in mind that high quality does NOT necessarily mean the car is in mint condition. IE A beat up, rusted,70s Cuda convertible (see our CUDA RENOVATION here at Big Fuel Garage) can have a bad engine and still be worth $500,000! Know the classic you are interested in, and research what “problem areas” the vehicle may have and check if the problem has been resolved (IE. many European classics have electrical problems so check that the components are in working order). Just because a car is rare, doesn’t mean it’s desirable…or valuable. Interior and exterior color, drive train, options, and many other factors all have a large bearing on the value of a Classic Car. Thoroughly research the Internet, price guides, car shows and car clubs. Many cities have their own small car shows and car clubs that can be both fun and informative. Collectors and dealers who show and sell their cars there love to talk “shop” all day. *smile* Talk to these classic cars experts, as all owners LOVE to talk about their cars. They will happily tell you all the pros and cons of owning a classic. Lastly, don’t forget the good, old Internet for great resources for classic car pricing and values…like Big Fuel Garage’s website! 3. Make Sure There Is A Clear Title to the Classic Car & It’s Numbers All Match! If available, obtain all the original sales paperwork on any vehicle, and all the receipts for work done by the previous owner(s). Documentation is important to establish current value and to pass on to the next owner if/when you decide to sell your Classic Car. Is the car registered to the current seller, or is not registered at all? DMV fees and penalties can be very costly. Check to be sure all the numbers match! IE Is the engine code right for the engine currently in the car? The vehicle identification number, (VIN) is coded with engine size, transmission type, body style, etc. Is the engine and drive train original and intact or has it been modified? If the current engine is NOT the one that came directly from the factory, it can devalue the car. 4. Get A Used Vehicle Report From The Internet! What state has this car been registered in? This makes a difference because, if the roads were salted when it snowed, salt causes corrosion and rust, which eats metal like cancer. Obviously, whenever possible, it’s always best to buy cars from states with a dry climate, which will not have a rust or corrosion problem. Rust can be repaired, but it must be done by a professional body man with rust repair experience. An Internet used vehicle history report on the car will assure you it has not been stolen and reveal how many previous owners the car had. Take your job as Car Inspector seriously. If you have a friend, have them come with you, as a second opinion is extremely valuable. Always try to view the car outdoors, in natural sunlight. Shadows can hideserious flaws in the body and paint job. Start by systematically checking the car’s body for obvious flaws. When you open the car doors, check to see if they sag. Look carefully down each side for signs of damage. Check out the seam gaps between the doors and hood to be sure they are straight. IE Are you able to roll a marble down them smoothly? If you can’t, the car has probably had body damage and been repaired. Pay close attention to inside the door jam area, down at the door sill plate, and the rear quarter panels for any signs of welding and other repair work, to see if the car has been “clipped.” (Clipping is where a damaged car has an undamaged car’s body panels welded in, and it’s recommended to stay away from this kind of repaired car.) Check underneath the car for rust and look inside the wheel wells. Inspect inside the trunk area, looking closely below where the rear window meets the package tray, as these are the most common areas for rust. Expect a little rust on an older car, but complete sections of floor boards or body panels welded in is never a good thing. Unless repaired by a professional body man, odds are, it will probably rust again. 6. All Parts Are NOT Created Equal! Parts availability is extremely important. Check websites (like Big Fuel Garage) and publications (likenHemmings Motor News) for parts sources for your vehicle. Abundant reproduction items, along with new or used original items, will make a car restoration project much easier. Depending on the age and make of the car the cost of repairs can vary greatly. The more common the car, the better prices and availability there are for parts. Make a “parts checklist” for yourself before you go to view Classic Cars. IE Check that the engine is the correct one. Check for leaks or stains from coolant and/or oil, worn belts and rusted battery trays. Check the wheels and tires. Are the wheels original and are they damaged? Are the tires bald or brand new? Check for the spare tire and jack – are they original? 7. Beauty Is NOT Only Skin Deep! Check the car’s Interior thoroughly too. Are the seats and upholstery original? Are all the original badges and emblems present and authentic (not reproductions)? Original seats and emblems can be very hard to replace in some of the older classic cars. Are the dash board and instruments intact, or has it been cut into for an aftermarket radio? Check the carpeting for water stains that might point to rusted out floor pans. Does the upholstery look intact? Does the VIN plate look original or tampered with? Write down a list of all problems, so that you can research the cost of fixing them later. Many owners spend all their money on the engine, at the expense of the interior. Interior trim pieces are tough to find, so you want one in the best condition possible. 8. Try Before You Buy! Set a date to view your Classic Car at both the seller and your convenience. The trick is to view the car quickly, yet without appearing too eager (IE Can I come over right now?) or too far in the future (because the car may be sold by then). The 1st step for every driver is to “start your engines!” Most muscle cars want to stay warm, and are difficult to start when the engine is cold. Open the hood, get in, pump the gas a few times and turn the key. If the engine doesn’t start in 5 seconds, turn it off, wait 10 more seconds and try again. If it doesn’t start by the 2nd or 3rd time…Houston, we have a problem. If/when you get the engine running, how does the car sound when you give it a a little gas? Does it rev smoothly and is the power instant? How does the car react when you apply the brake? Does it slow down smoothly? Get out and check under the hood to see if the radiator fan is spinning smoothly and the belts aren’t squealing. Make sure that the engine idles pretty evenly as well. Now for the rear end…Check the exhaust coming out of the tail pipes. Are there any strange smells on the outside of the car? There should be NO dark smoke coming out, which would indicate leaking oil in the engine or worse. NOTE: pre-1977 cars don’t have Catalytic converters, so they will produce FAINT, visible smoke. Finally, listen to the exhaust to be sure it’s fairly even, otherwise, there may be a leak in the exhaust system or the engine needs a tune-up. Take the car for a test drive of at least 20 minutes, as most serious problems will become apparent by then. NOTE: If the seller drives, they can hide a lot of flaws. Pick a test drive course that allows both slow and fast driving, stopping and accelerating, straights and turns. Listen for any noises, squeaks, clunks and all other sounds. How does the car feel going around corners and over bumps? Is it loose or does the suspension “groan” like it will need some repairs? Does the car drive in a straight line, or pull to one side? Do you notice any strange odors inside the car when it is running? Do all the interior accessories work (Air Conditioning, Power Windows & Locks, Convertible Top)? After you take the car back and turn off the engine. Does it make any strange noises? Remember to TAKE NOTES, making a list of all things you saw, heard, smelled and felt from the car during your test drive! Now is the time to ask all your questions of the seller too. Inquire if there any spare parts or tools that come with your Classic Car purchase. Most sellers have extra parts they never got around to putting on the car. Always request the seller include ALL the original car parts (such as factory exhaust manifolds) that they took off to put on aftermarket parts (such as headers). There are a LOT of “scam artists” in every industry, including the auto one. In addition, loads of amateurs list their cars, whether intentionally or not, with misinformation. Put in the time to do your homework, look at more than one car and don’t buy one until someone with “classic car” experience looks at your choices. Consider having a vehicle appraiser look at the car. They may be able to tell if its been in an accident, or if the engine, transmission and other vital components are not original. This will all alter the value of the vehicle greatly. Although, Classic Car ownership costs a lot more than other “used” cars, as parts and service costs are higher, the joy your new addition will bring is…PRICELESS. 10. Put Your Money Where Your Mouth Is! Always use cash to your advantage. IE. If the seller says the price is $10,000 firm, bring cash and mention that you have $9,000 in cash…right now. Then…show them the money! The sight of a lot of money is tough for most people to refuse. *smile* Casually point out any flaws you found in your inspection and test drive. Don’t try to make the seller feel badly about their car, just let them know that you noticed the flaws, and are mentally taking them into account in your bid price. NOTE: If you know the car is worth $7,000, do NOT scare the seller with a “low ball” offer, like $3,000. A smart seller will assume you are not serious, or think you’re trying to take advantage of them, and will be scared off and/or insulted. If they are dumb or just plain desperate…all bets are OFF! No matter where you start your bidding, ALWAYS NEGOTIATE A BARGAIN. Remember…every dollar you save can go directly to buying Classic Car parts. Lastly, be sure to get a written, or at least a verbal, agreement from the seller that they will NOT sell the car to anyone else before your next meeting, which the seller may insist be within the next 24 hours. Buying a Classic Car is often a large investment and should be treated as such. Get all the facts concerning that particular car BEFORE you go to view it and you will be much better off when negotiating the purchase price. Be sure to purchase proper insurance and have protected storage available. 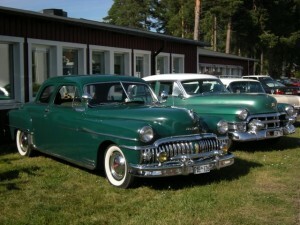 Collector Car insurance is the cheapest option (see our article on Collector Car Insurance). Once you own a classic, you will enter a whole new world full of Classic Car lovers…welcome to the club!